Acapulco, Mexico is seen in this photo from October 29, 2016. 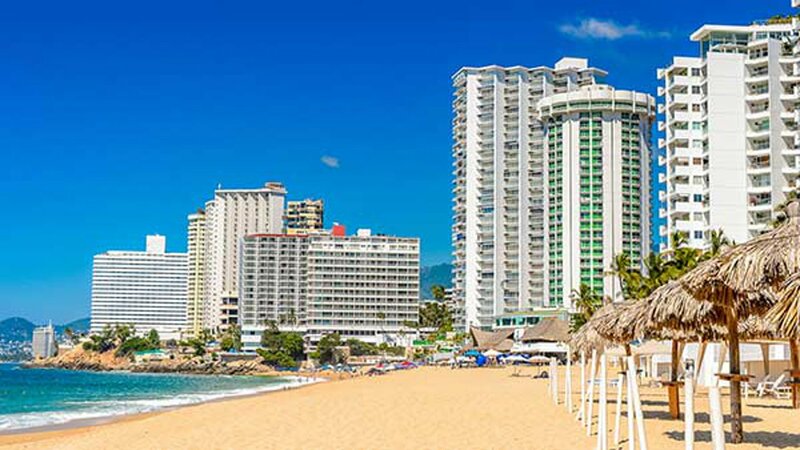 MEXICO CITY -- Seven people have been murdered in the beach resort of Acapulco as the city continues to grapple with a violent crime wave, Mexican authorities said Wednesday. The killings on Tuesday included the slaying of two men and a woman at an apartment used as an office for a taxi service. Guerrero state security spokesman Roberto Alvarez said both men were bound with tape and all three were shot in the head. Family members said the men were taxi drivers. Acapulco registered 483 homicides in the first seven months of the year. That was down about 13 percent from the same period in 2016, but still on pace for it to remain Mexico's deadliest city. Nationwide, homicides are up 27 percent so far this year. In northern Mexico on Wednesday, a man who had been chased and shot by attackers along a wide boulevard leading to the hotel zone in San Jose del Cabo crashed his car into the local offices of Mexico's tourism promotion agency, the Baja California Sur state prosecutor's office said. The man died of bullet wounds. The tourism office sits across a landscaped median from a large shopping center. The resort cities at the southern tip of the Baja California peninsula have suffered increasing violence as drug cartels compete for control.